The second morning of the Space Coast Birding and Wildlife Festival, it was raining when we got up. When we headed out at about 8 AM, it was thunderstorming …complete with nearby lightning. By the time we arrived at the Helen and Allan Cruikshank Sanctuary, there were puddles everywhere but was the lightning was gone and the rain was slowing. We headed out walking around the larger mud puddles. The sanctuary is managed to stay scrub – which requires periodic burning. 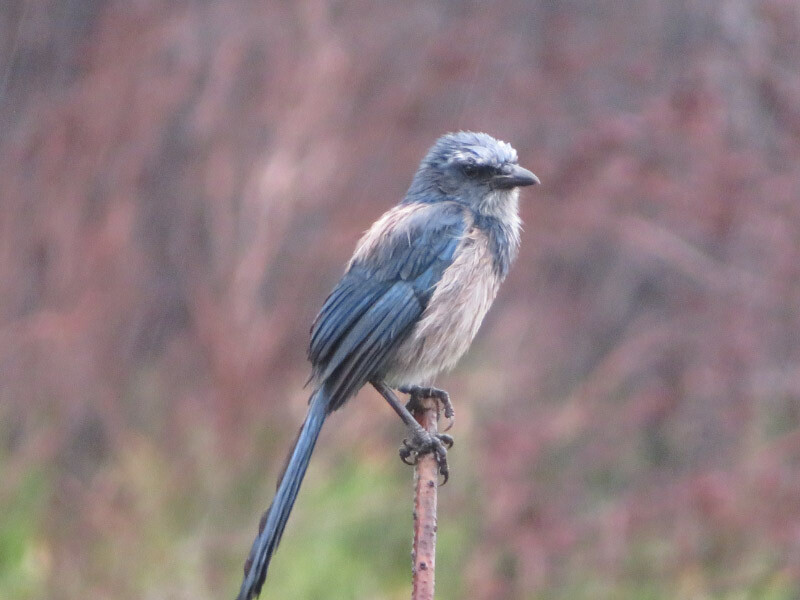 There are occasional live oaks, but most vegetation is low…and the Florida scrub jays love it. They were everywhere and acclimated to people being around. Even with the light rain and thick clouds, I managed to take some pictures. The blue color changes in different light but I discovered that once I zoomed in enough, the birds were colorful even in the low light (from afar they looked like dark gray birds!). The birds bury acorns in sand and remember where buried food is better than squirrels. It was obvious that people had left peanuts for the jays because we saw a bird dig up a peanut still in its shell! The sanctuary is an island surrounded by housing development…and the invasive Brazilian pepper is growing among the native vegetation. I learned that some people have skin sensitivity to the plant – like poison ivy. There were mounds of lichen on the ground. 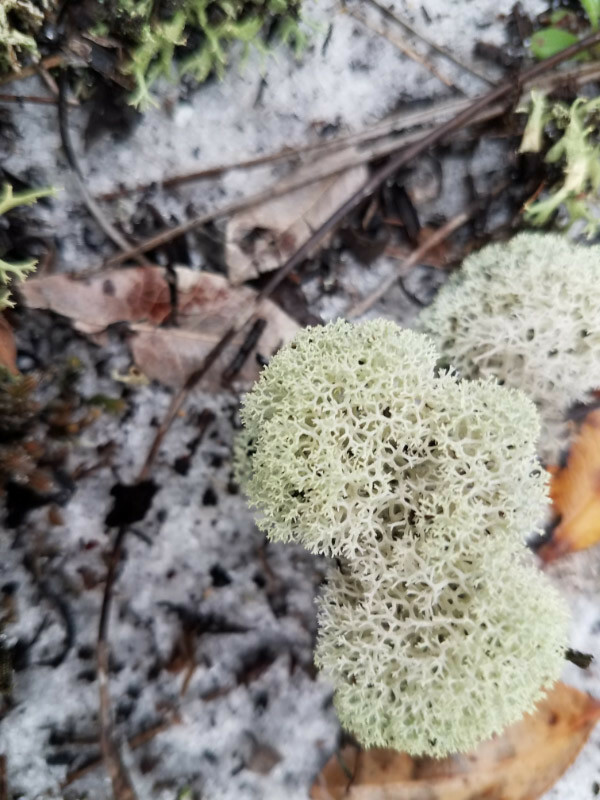 It looked like reindeer moss (maybe the same genus: Cladonia). I went back to take a close up picture with my smart phone and macro lens….even though the next line of rain was coming through and the hiking group was dispersing a bit early.